We all know that Samsung is going to bring the Infinity Display to its mid-range smartphones and there have been a lot of leaks of the upcoming Samsung Galaxy A8+ that will be the most high-end member of 2018’s A-series. There have been leaks related to the design, specifications and more till now. 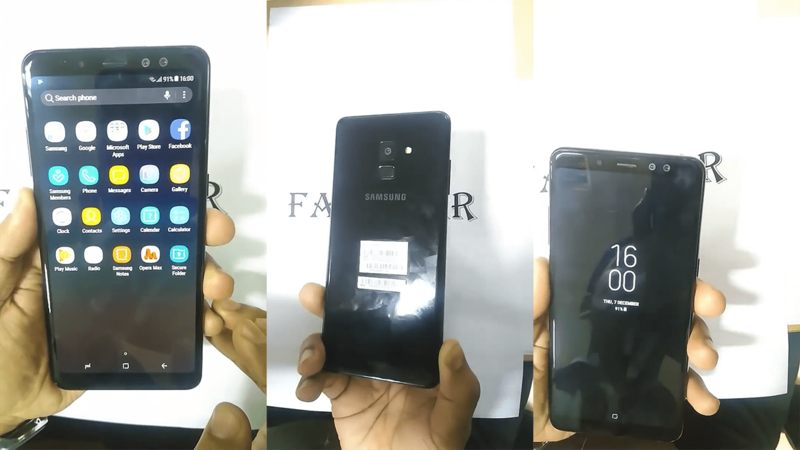 Today, the hands-on video of the phone leaked out that left nothing to know about the design and also confirmed the previously leaked renders. Along with this video, all the major specifications of the phone were also revealed. So, the Samsung Galaxy A8+ features a 6-inch Full-HD+ Super AMOLED display with a resolution of 2,280x1080p. There is a 2.5D glass on top of the display, and the phone has a Glass & Metal design just like the high-end Samsung flagships. It is powered by an Exynos 7885 processor, which is an octa-core processor. There is 6GB of RAM along with 64GB internal storage that can be expanded up to 256GB. Under the hood, the Galaxy A8+ is powered by a 3,500mAh battery. There is support for Fast Charging, and the phone has USB Type-C Port. Coming to the cameras, there is a single 16MP rear camera with f/1.7 aperture while there is a dual camera setup on the front with the primary 16MP f/1.9 lens and the secondary 8MP f/1.9 lens. The front camera has features like the face unlock. The phone is Water and Dust resistance too. For the first time, the Mid-range smartphones from Samsung are getting On-Screen buttons. It is good to see that the fingerprint scanner is placed at the position which can be easily reached. The official user manual of the phone has also leaked via the official site which confirms the design along with some other specs like NFC, USB Type-C, Dual Front-cameras, Infinity Display, etc. You can check the user manual here. What do you think of the design and specifications? Do let us know via the comments section.